I mentioned in my previous post that two weekends ago I was in town for one of my best friends' wedding. 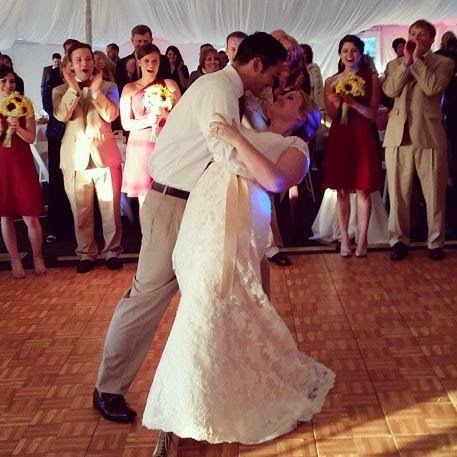 When it came time to say their vows it was so beautiful, sweet, and living, but man did it take a lot to get there! Julia should give all brides lessons on staying calm on their wedding day. She was so poised through the entire day and kept her thoughts on saying "I do" and rolling with the punches. Julia originally chose a gorgeous vineyard for her wedding less than a month after they got engaged last summer. She is such a planner, and wanted to lock that down asap. Then in January the venue called her and cancelled. (!!!) Okay, they technically didn't cancel because that would be a breach of contract, but they called her saying they had lost their liquor license, couldn't serve food, and if they played music they couldn't guarantee the neighborhood wouldn't call the cops. Um, excuse me? After some scrambling he managed to find another option that she liked, and maintain most of her vendors. This venue was a gorgeous golf course in Baldwinsville, NY. There ceremony site was outside at a gazebo right next to the water with gorgeous flowers exploded everywhere (tastefully, of course). With the sun shining at 4:30 it was so stunning at the rehearsal! Then, we woke up Saturday morning to 45 degrees and a torrential downpour. No worries though, as a bridesmaid it was our job to keep the positive thoughts rolling! We met at the salon, beautified, and did multiple sun salutations praying for it to show itself. Well, the salutations must have worked because by 2pm the clouds parted and the sun was shining! We all headed over to the venue to get into our pretty dresses and take some pictures. At 4:20, about 10 minutes before the ceremony was supposed to begin, we saw a gigantic, dark, angry cloud coming towards us...and coming fast. Thankfully, the wedding coordinator was on top of it and suggested postponing the start for about 15 minutes, since it was just one cloud and once it passed the outdoor ceremony could begin! 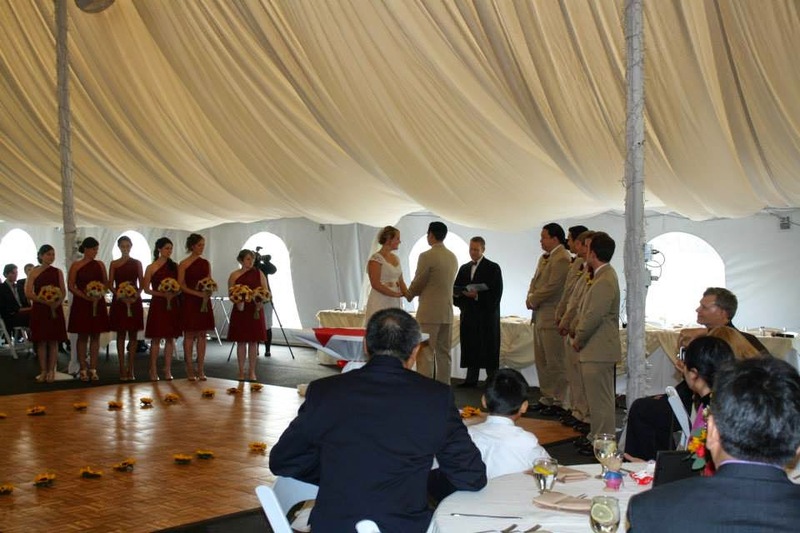 To make a long story short, the rain came pouring down, some guests were hidden in the gazebo to stay dry and more guests were waiting in the reception tent up the hill to try to stay dry. 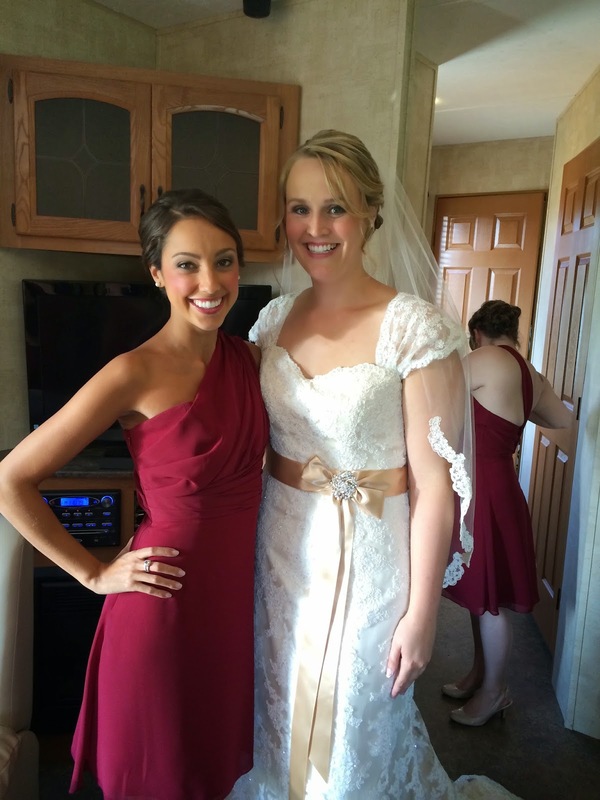 People kept bombarding Julia with negative comments and I about went Bridesmaid-zilla on them! The two wedding coordinators kept going back and forth with Julia about what she wanted to do and it just got really stressful for everyone! Finally, Julia put her foot down and just decided that since most guests were in the tent they would just do the ceremony there. Problem solved. When the time came for the now-inside ceremony to begin you would have never known about all of the drama before. The men looked so handsome and watching Julia walk down the aisle was so moving! I pretty much held it together until Mike said his vows and then GOODNIGHT. Tears everywhere! Julia was the epitome of grace the whole day. Even when upset she kept the final goal of marrying her best friend at the front of her mind, and it showed the minute they saw each other! They fill me with such joy! Also, I have to give a special shout out to my best friend, Felicia, for sharing her hubby with me! Dom wasn't able to come due to an exam, so Kevin took one for the team and had two dates. Wow that was some wedding. I am glad your friend handled it with grace and didn't let it ruin her day. 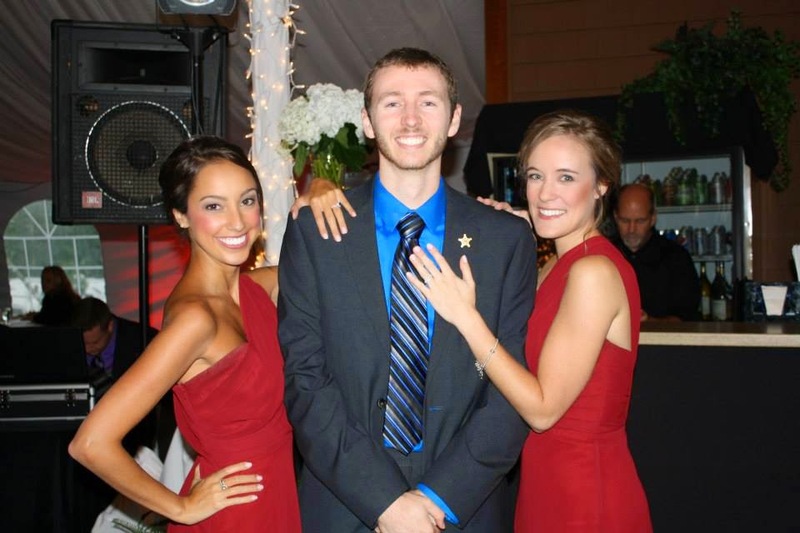 Kevin was lucky to have two dates for the wedding! It sounds like just about everything went a little wrong but luckily the bride had such a positive attitude and beautiful, optimistic bridesmaids to help her through it all. You looked gorgeous girl! Oh my gosh that bride is definitely calm and collected especially the news with her first venue!! Loved her dress - she looked beautiful! Whew! What a wedding! Bless her heart. Thank goodness y'all kept things "positive." - You looked beautiful! Oh. my. goodness. So good of y'all to stay so positive, that had to be hard! I dream of an outdoor wedding one day, but you do have to be at the mercy of the weather. Glad it still turned out so well & love those bridesmaids dresses! The wedding looks so fun and it looks like it was gorgeous!! Love the bridesmaids dress colors! That's so great she was able to stay so calm. oh my word what a story!! we're getting married next august outdoors - super scary! so glad it turned out to be okay and i can only pray i'm half as poised as your friend!! What an adventure! A good friend is having a beach wedding in a few weeks so we'll be doing some sun salutations of our own! Employed ladies want to flaunt his or her stone bands thus to their friends and people, Engaged Bloggers having take great pride in with the truth that they are gonna get into a whole new fascinating chapter with their lifestyles.